M7 J Brace Strut Tower Brace for 2007+ R55, R56, R57 R58, R59 MINI Cooper S. If you have the JCW John Cooper Works intake on your MINI, this strut tower M7 J-Brace is made to clear your airbox. It helps to protect against mushrooming of the strut towers, and provides some added stiffness to the front end. 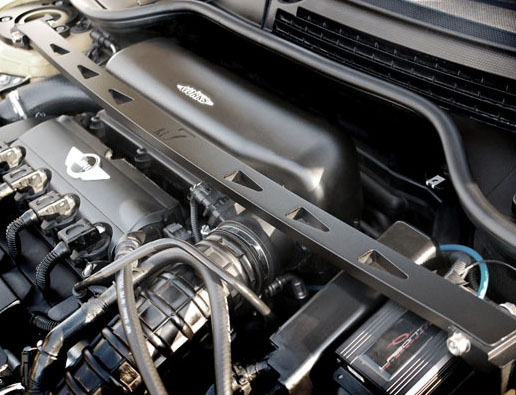 In addition to the JCW intake, this brace will also work with many other aftermarket intakes. It is a solid CNC-machined aluminum bar.